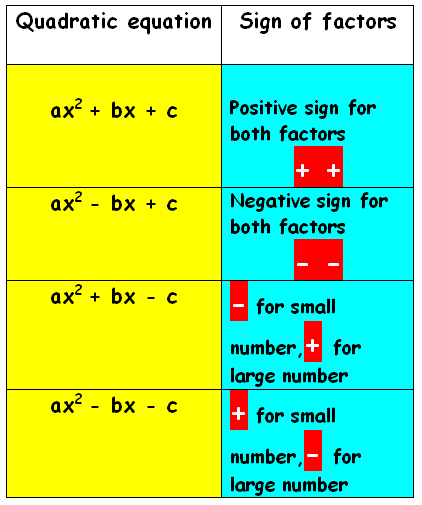 On this page "factoring quadratics when a is not equal to 1",we are going to see how to factor a quadratic equations in a simple and easy way. Before going to find factors we have to notice whether the coefficient of x² is 1 or not. 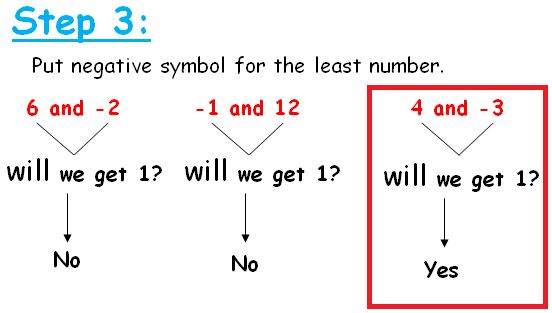 If it is not 1 we have to follow the below steps. 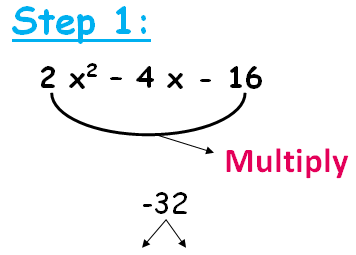 (i) Multiply the coefficient of x² by the constant term and we have to split it as two parts. Let us see some examples for better understanding. Since the last term is having negative sign.we have to put negative sign for the least number. 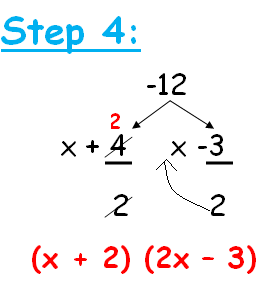 Now we have to divide the two numbers 4 and -3 by the coefficient of x² that is 2..If it is possible we can simplify otherwise we have to write the numbers along with x. So (x + 2) (2x - 3) are the factors of 2 x² + x - 6. 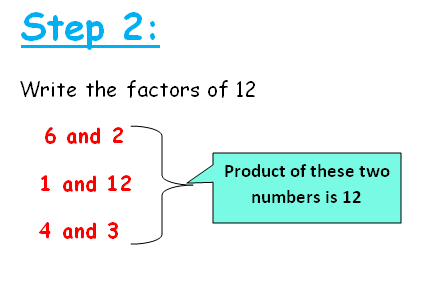 Let us see the the another example to understand the topic factoring quadratics when a is not equal to 1. To factor this quadratic equation we have to multiply the coefficient of x² by the constant term. Now we have to split -32 as multiple of two numbers. 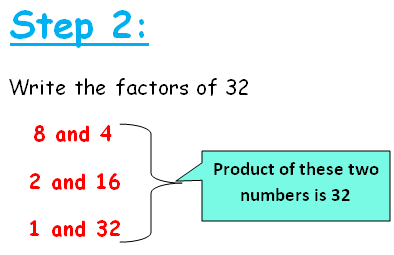 For that we have to write the factors of 32. 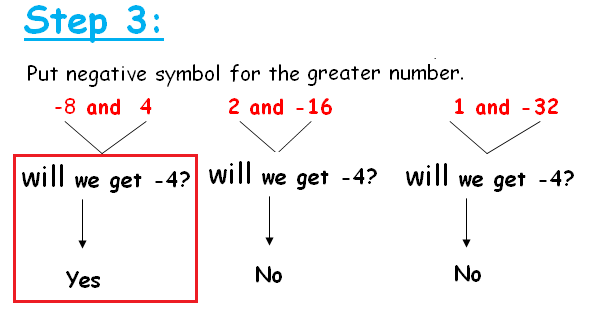 Since the last and middle term are having negative sign.we have to put negative sign for the greater number. Now we have to divide -8 and 4 by the coefficient of x² that is 2..If it is possible we can simplify otherwise we have to write the numbers along with x. So (x + 2) (x - 4) are the factors of 2 x² - 4 x - 16. If we multiply 6 and -5, we get -30.Now we have to split -30 as the product of two numbers. So (3x - 1) (2x + 5) are the factors of 6 x² + 13 x - 5. 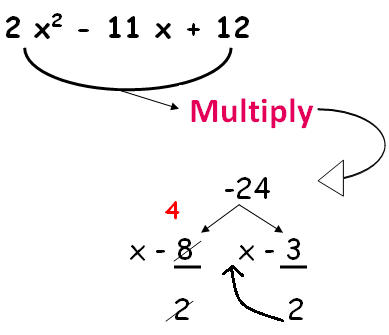 If we multiply 2 and 12, we get 24.Now we have to split 24 as the product of two numbers. 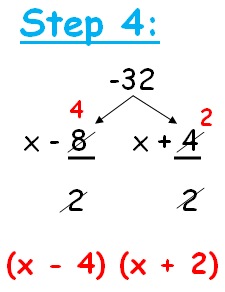 The product of -8 and -3 is 24 and the simplified value is -11.Since the middle term is having negative sign,we have to put negative sign for both 8 and 3.